My computer boots to a black screen, what options do I have to fix it? I am trying to boot Ubuntu on my computer. 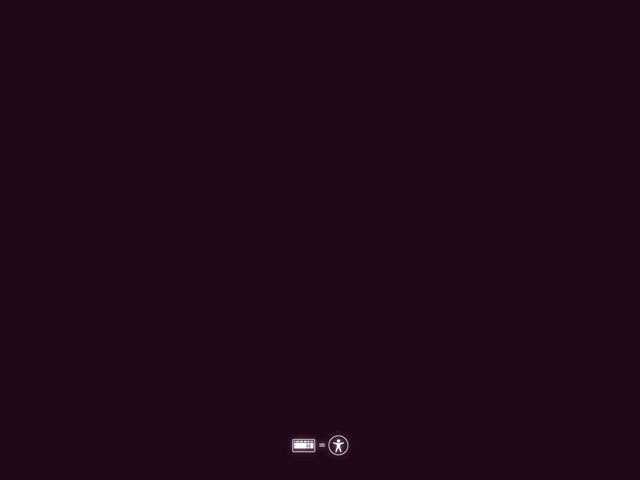 When I boot Ubuntu, it boots to a black screen. How can I fix this? Check out these steps to see how to check your CD once you boot into it to make sure it's ready to go. Verify the integrity of the burned CD/DVD or written USB flash drive (this also checks that it's accessible by the computer on which you wish to install). Press F6, use the ← ↑ → ↓ keys to go down to nomodeset, and press Enter. An x will appear to its left. Then press Esc, and press Enter to "Try Ubuntu without installing." You can also try acpi = off and nolapic if nomodset also shows up as a black screen. If your machine is CSM capable (which is a full UEFI implementation with an emulated BIOS layer) after selecting any option from the grub list the system will hang at a black screen. The picture above actually only confirms your DVD/USB booted using UEFI and there will be some means in firmware settings to ensure drives are booted in order to make the UEFI installer run (a solution may possibly be as simple as ensuring SATA is set to AHCI) - check your vendors manual! Also check the UEFI Community Documentation Section 2.3 for more details. If you cannot find UEFI settings then enable CSM - this will disable the UEFI booting of the installer and then allow a legacy/BIOS install of Ubuntu. Some machines use a full BIOS with an emulated UEFI layer which may throw errors as described ie "you need to load the kernel first" and "can not read file/cd0"
This usually happens because you have an Nvidia or AMD graphics card, or a laptop with Optimus or switchable/hybrid graphics, and Ubuntu does not have the proprietary drivers installed to allow it to work with these. The solution is to boot Ubuntu once in nomodeset mode (your screen may look weird) to bypass the black screen, download and install the drivers, and then reboot to fix it for ever. Start your computer, and press the Right Shift when booting up, to get the Grub menu. Use the ← ↑ → ↓ keys to navigate/highlight the entry you want (usually the first one). Find the linux entry as shown above, use the ← ↑ → ↓ keys to get to it, and then press the End key to get to that line's end (which may be on the next line!). 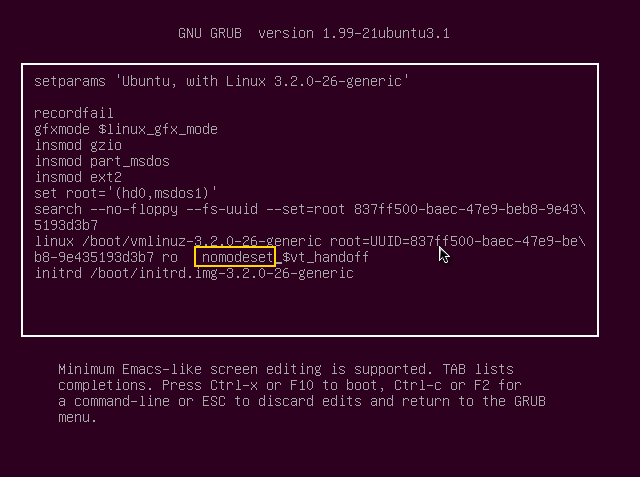 Enter nomodeset as shown, and press Ctrl+X to boot to where you can successfully install your graphics drivers. If you are running Ubuntu 12.04 or 12.10, and have a ATI/AMD graphics card, you have to follow the instructions here, otherwise you will run into this problem every time you restart your computer. In case you've installed Ubuntu with LUKS encryption / LVM option, it could be that Ubuntu just asks you for your password - and you cannot see it. If you have a black screen, try pressing Alt+← and then Alt+→ to switch your tty, this may bring back the password query and turn backlight back on. If you have a purple screen (maybe you need to set the nomodeset-option also?) and you have encrypted your complete Ubuntu installation, try to just type your encryption/LUKS-password after waiting some seconds (or minutes, just to be sure) and continue with a press on Enter. If this is successfull, you should see your Login-screen just a few seconds later. Try the Alternate Installer - this is a text based installer that might work better than the liveCD depending on your hardware. After selecting boot options you have the opportunity to edit the boot flags manually using your keyboard. Replace quiet splash with no splash to get an idea of what step your system is failing at. Using that information search the forums or the internet for answers from the community. If you still can't install Ubuntu then unfortunately you've probably run into a hardware specific bug, please see here: How do I report a bug? Fglrx causes serious bug-black screen! How to enable boot messages to be printed on screen during boot up? How do I investigate boot and partition issues? I can't boot into a usable system after updates. What should I do? Sometimes a kernel upgrade can cause problems, especially if you're using closed drivers, you can confirm if this is the case by booting into your old kernel. How can I boot with an older kernel version? If your old kernel works then you've found a bug in the new kernel, see the end of this post to report it to the kernel team! If you still can't boot Ubuntu then unfortunately you've probably run into some other kind of bug, please see here: How do I report a bug? Use the arrow keys to replace quiet splash with no splash or nomodeset. Then press the Ctrl+x key combination to boot. Use the arrow keys to replace quiet splash with radeon.modeset=0. On certain laptops (like HP Pavilion), you may boot to a black screen due to low screen brightness. When booting press the ESC Key or leave the SHIFT key pressed until the GRUB menu appears. There are 2 ways to install the Proprietary Drivers. the PPA Way or the Default Ubuntu way. The Default Ubuntu Way involves just typing in the terminal sudo apt-get install nvidia-current (For the current normal drivers) or sudo apt-get install nvidia-current-updates (For the latest current drivers). Just pick one. sudo add-apt-repository ppa:graphics-drivers/ppa and press ENTER to accept a message you will receive. Then do sudo apt-get update. Lastly do sudo apt-get install nvidia-375. Note that you can not mix this one with the Ubuntu way. One will overwrite the other one. What we did there was remove the monitors.xml to solve some resolution problems, remove the .nvidia-settings to fix some Nvidia config problems and remove the xorg.conf (Which is not really needed in the latest Ubuntu versions) to remove any badly configured options. 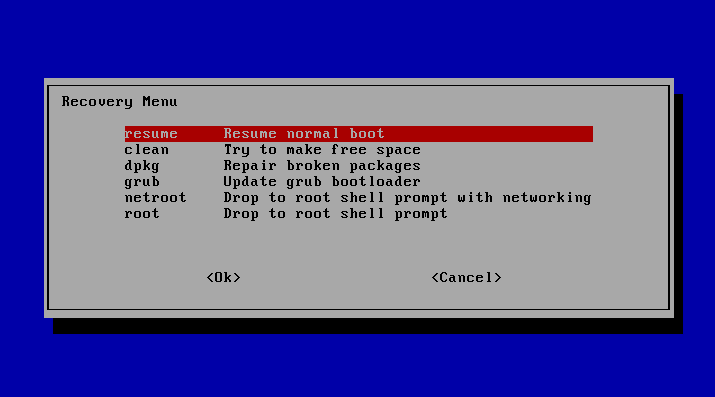 Lastly we can execute the grub option in the recovery menu to fix any bootloader issues. I had this problem last night. All of a sudden my system wouldn't boot up anymore. BIOS check would finish, then it would just hang there on a black screen with the cursor flashing. Left it there for several hours just in case. When that didn't work, I unplugged all my USB devices and all of a sudden it booted up fine again. I haven't narrowed it down exactly, but in my case it was either my USB hub or the iPod plugged into that USB hub that was causing it to hang. Not saying this is necessarily the problem you're having, but hope your boot problem is as easy to fix as unplugging some USB devices...! Wubi overrides are identical to normal installs except the first time you reboot after running the installer in Windows. To complicate things, since Ubuntu 11.10 there are two distinct methods to install with Wubi. The first way is using the Desktop ISO, which applies to all sub-flavours (Kubuntu, Lubuntu, Mythbuntu etc.) and also if you downloaded the Ubuntu ISO yourself. The second method is using a pre-installed disk-image, if you run wubi.exe standalone and choose to install Ubuntu. Now press Ctrl+X to boot. NOTE: This only applies to the Installation; the next time you boot you have to override it again, and for this it will be the same as for a normal install (answered above). Make sure you hold Shift to make the Grub menu show though. Note - if you've come to this thread after booting for the first time, it's possible that the grub.cfg has already been created (even if it froze up). In this case, editing the \ubuntu\install\wubildr-disk.cfg file will do nothing - it always checks for /boot/grub/grub.cfg inside the virtual disk first. So you should follow the instructions for the normal install above. Note also that the Grub Menu is suppressed by default on Wubi installs (even though there are two operating systems - because you boot Ubuntu from Windows, and therefore adding a Windows entry from Ubuntu's Grub Menu makes no sense) so you have to press and hold the Shift key after selecting Ubuntu in order to display the Grub Menu. On Windows 8, it reboots after you elect to boot into Wubi, in which case, you should hold the Shift key after the BIOS posts. (This is only for Windows 8 with BIOS - Wubi doesn't work with UEFI). I also had this problem, or a similar one. It turned out that, for some reason, Ubuntu had started with the screen brightness on its lowest setting. If I went into a very dark room, I could see the screen just well enough to go to the "Brightness and Lock" control panel and turn the brightness up to where it should be. I hope this fix your problem. I realize this is an old question, but it's also pretty general without any details about the specific hardware involved. That said, you can't file a bug or go about fixing things until you figure out some more details. I thought I'd take a stab at this since I faced the issue and recovered from it pretty recently. I'll probably run through here again later and throw in some more info and simplify the steps, but the answer list is already pretty big, so I'll go easy on the screenshots. Recovery mode is your friend, but you don't always need a single-user root session to solve things. In fact, you might just be able to do a normal console login by selecting "resume" without considering any of the other options on the recovery menu. The nice thing about a normal console session over the single-user root mode is that you can get multiple terminals running at once--Switch between them or open up new ones with Alt+F1, Alt+F2, etc. There's a good chance that it's a video driver issue which is preventing you from going into the graphical login, and it might just be a result of some upgrade you did before rebooting the computer. You might go a couple of years at a time without experiencing similar issues, but it's a good idea to know your hardware and to be prepared to use the terminal. Basically there are two video drivers to worry about: the kernel driver and the xorg driver. Xorg is a video server that uses the x11 protocol to display things in full color with depth and all kinds of crazy effects--It's an abstraction layer between applications like the desktop environment or windowing managers and the kernel driver. The kernel driver is yet another abstraction layer, but it's a bit closer to communicating with the actual hardware. It's the kernel's job (in this case, Linux) to pass messages between applications and the hardware. The drivers can either be compiled into the kernel or added in a more ad hoc way through kernel modules. Probably you're using modules unless you configured and compiled your own custom kernel. The kernel driver as a module gets loaded shortly after you boot up, which allows for easier upgrades when you power down to swap out a card. The good news is that there are some more or less standard tools that you can run from the command line to give you more information about those kinds of drivers, the actual hardware and whether they're loading: lspci, dmidecode and dmesg, to name a few. There are man pages (e.g., $man dmidecode) and many howtos on those kinds of tools, so I won't go into too much detail here for now. If you upgraded an Xorg driver without directly upgrading Xorg itself, there's a chance that reverting to the old driver via apt-get install will not automatically pull in the version of Xorg that it's compatible with--It should but apt doesn't always do what it should. Minimally, you'll need a matching version of xserver-xorg-core. Don't bother with uninstalling the upgraded xorg replacement though, just enter the command apt-get install xserver-xorg-core to revert back and uninstall the newer version automatically. This advice applies mostly to transitional renamed packages which provide virtual packages to replace ones that are still being maintained in the same branch of the package tree. Virtual packages are sometimes a mess and can do funny things with any of a number of dependencies which are getting swapped around in the upgrade/downgrade process, but concentrate on getting back to the GUI first. Now that I've given an overview of some directions to start with troubleshooting, let's get back to the console screen that you hopefully pulled off without a hitch from choosing "resume" at the recovery menu. It's a pain to be stuck without a mouse at the console when you've got a lot of copying and pasting to do, so prepare yourself with some gpm for mouse support and some other tools: links/links2 or w3m (web browsers), vim (text editor), dpkg, apt, less (vim style keys and searching like man), and grep. I'm probably leaving a few out. Some particularly useful commands for dpkg are dpkg -L to show files for packages that are already installed and dpkg -l | less to show all packages which are currently installed (piped to less).Sometimes gpm is a little finicky about letting you select things, so you can restart it with /etc/init.d/gpm restart but you might have problems with clicking on links in a page before you restart w3m or the browser links. w3m is a little easier to scroll around and generally better for authenticated sessions (e.g., logging into forums for help). It takes a bit of getting used to hitting the Esc key to click on links (the hyperlinks) though, and the learning curve is a bit steeper than with the browser known as links. Unless you've got an Nvidia card or something with proprietary driver support for linux that you want to try, I'd shy away from kernel drivers before trying things with xorg--Try troubleshooting the xorg drivers first because it can be a lot easier than customizing a kernel for hardware (depending on the brand). The thing is that you might wind up following a series of links that lead you in the wrong direction, with chip makers sending you to the card makers and card makers giving you no support. As for trying out different kernels for different "vanilla" versions of the driver, stick with kernel versions that aren't far off from your current one (given by uname -r) unless you're really interested in testing. There's a pretty good chance that the latest mainstream kernel won't even boot up on your system, so why bother if you're stuck with a half-way broken setup? Keep focused on doing the bare minimum that it takes to get back up again so you're not falling behind on too much work. You can type things up in emacs, vim or pico/nano or check your email in mutt or pine, but eventually you'll want to come back to the 21st century. If you have more than one video port on your graphics card (or more than one graphics card), then plugging the monitor into a different port may fix the problem. I've had an issue in the past with dual-DVI graphic cards, where it won't boot using one of the ports (secondary maybe? ), but works fine on the other port. Chances are your computer's ACPI is not supported. Ubuntu 10.04 supported drivers for the ACPI, but dropped supported for that since 10.10. 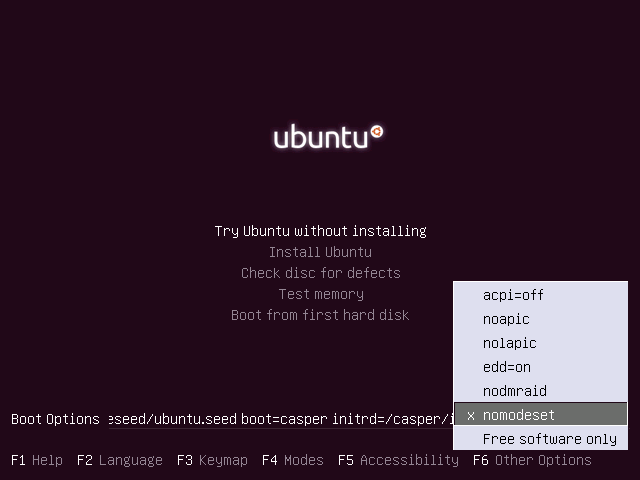 To try that, change the BootOptions to nolapic and see if the Ubuntu Live CD boots (info). Go to BIOS > Security> I/O interface Security> "New interface card". Set it to Locked. Make sure you have a Windows Recovery CD available if you have Windows, because Windows may show up as an error. Or, disabling the ACPI, which is not recommended because it may disable some crucial features on you computer (like fans). This is not recommended unless you have tried the first option and you know what you are doing! Press the key indicated during the startup messages (usually F2, Esc, or F1) to enter BIOS. Click on the "Power Settings" menu. Highlight the ACPI entry, press Enter, select "Disabled" and press Enter again. Press Esc and Y to exit and save. Again, make sure you have a Windows Recovery CD available if you have Windows, because Windows may show up as an error. Different PC manufacturers have different BIOSes, so read your computer's manual if your computer's BIOS doesn't show up. open TTY (ctrl + alt + F1) to type the commands. make sure the radeon open-source drivers are installed. after that I could reboot and login. mv ~/.Xauthority ~/.Xauthority.old and retry to login. I upgraded from 10.10 to 11.04 to 12.04 LTS, and when 12.04 loaded for the first time, I had a blank screen after the GRUB menu. It actually booted fine - I could SSH into the system as usual, but the video at the actual console didn't work. Booting into recovery mode worked fine, too. Here was the solution. Turns out I had to create a LiveCD and completely reinstall GRUB. After I did this, things are working fine again. Documentation for re-installing grub is here : help.ubuntu.com. In the text editor, add FRAMEBUFFER=y to the file. Save the file and quit the text editor. I have had this problem a few times. I occasionally get errors detecting one of the HDDs, and I think the boot order gets corrupted in the BIOS. Fixing the boot order solves the boot problem. I have an old Nov 2005 ASUS mobo with a 750 GB WD and a 1.5TB Samsung hard disk. When the grub boot menu comes up, press e to edit the correct boot line. 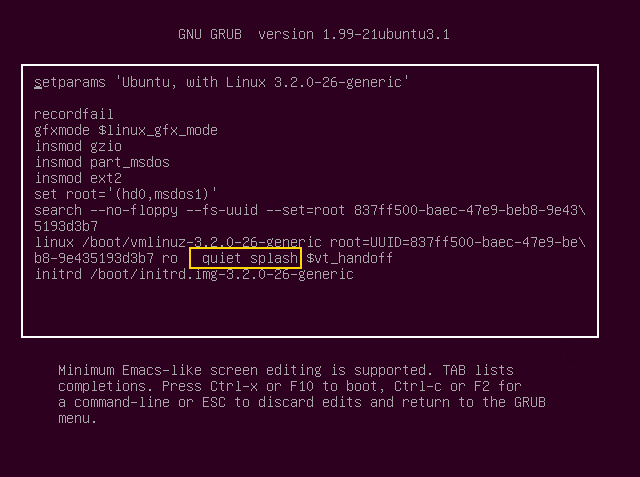 Where it says GRUB_CMDLINE_LINUX_DEFAULT="quiet splash" change this to GRUB_CMDLINE_LINUX_DEFAULT="quiet splash nomodeset". If this works, then you can install proprietary graphics drivers which should get you going again. If you have trouble with the above, you can change the above line permanently in the grub configuration file. Boot into recovery mode (selection from the grub boot loader) and edit the file /etc/default/grub as per the above instructions. I had this issue with Ubuntu 12.04 64bit version. I install all goes well, I enable the Nvidia drivers reboot and nothing but a black screen. I re-installed several times with the same results. I then remembered that I had this problem with previous versions of Ubuntu. I downloaded and installed the 32bit version then installed the Nvidia drivers and I did not have this issue. It only happens when I use the 64bit version with the Nvidia drivers. In case that the black screen is only intermittent (and that there might be a blinking cursor), lightgdm having a race condition and not being able to start properly could be the issue. At least that was the case for me. See here for a solution: http://www.webupd8.org/2013/01/ubuntu-lightdm-black-screen-when-using.html (see also this bug report). The gist of it: Use gdm and not lightgdm (i.e. sudo apt-get install gdm, and choose gdm as default login manager when asked). Let me quickly describe the symptoms I had: At first, because also the graphics was having a problem, when this problem occurred, I would only see a blank screen, and no chance to switch to the other terminals by pressing Ctrl+Alt+F1-6 (the screen simply stayed completely black, or rather, a very dark purple or something). This I fixed by adding the "nomodeset" kernel option, as stated e.g. in this answer. But after that, I still intermittently couldn't boot up properly; now it would stop with a blinking cursor. And this, as the above link tells in more detail, is caused by lightdm having a race condition - which manifests itself mainly if the boot-up is very quick, e.g. from an SSD (as it is the case for me). Also, I've used http://sourceforge.net/projects/unetbootin/, maybe it helped. Remove Graphics Card from your machine. After Ubuntu is installed then put graphics card back into machine while the tower still powered off. Then swap your VGA/HDMI/DVI cables to the graphics card. 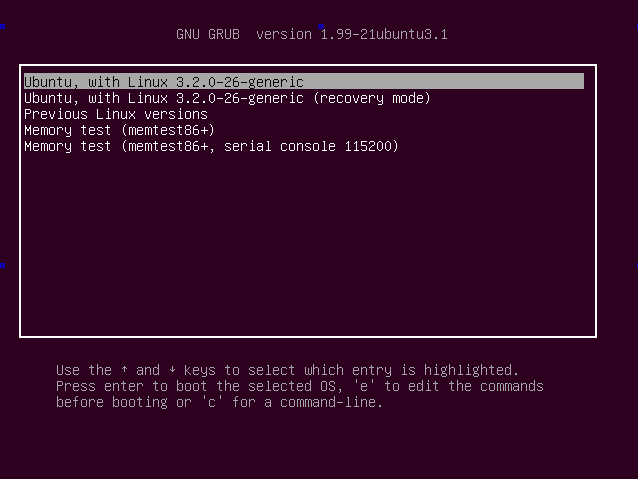 Turn on computer and select the recovery option from the GRUB menu then boot normally. Install Driver using the following steps. a. Move the driver to the desktop and rename it something simple and easy to remember. Boot computer and enjoy :) I suggest printing these instructions. PS I am not sure if you can place graphics card into PC after installation this is the way it worked for me and I am passing it on. I might suggest trying to install the graphics card on step 1 with machine off first as it is much safer this way. I tried those methods as well -- no joy. Here's what did worked for me. Actually, I already had this resolution. But the added commands got rid of the black screen on boot-up and the need to switch video modes. This is specific to where the install fails and your installation behaves badly. You need access to the Recovery menu, if you don't then look for other options. GUTS! Since this is a delicate process. Once you are in the recovery menu, select Activate Networking. Now select drop to a root shell. Verify that your network is up and running: ping -c 2 4.2.2.2 If this fails run dhclient. ping -c google.com if this fails run dhclient. Run debsums -s. It will give you a list of packages that have problems. Take note of each. Now reinstall the packages that has problems: apt-get --reinstall install packages. Update your grub just in case. update-grub. I've noticed that it would be a brightness problem cause I've listened to the Ubuntu's default drum sound when booting for the first time after upgrading. Before I find this solution, I had to increase the brightness level to see anything on the screen. That's it. After rebooting, it worked flawlessly for me (that is, my login screen has a normal brightness level). It turns out the ATI Catalyst drivers were not compatible with the 13.10. I ended up re-installing the OS from the live CD and everything went fine, except now I have to figure out why there is no sound. I just had a similar issue with Xubuntu after installing ATI catalyst drivers. Purging the 2 fglrx packages allowed me to log in properly and have a desktop....though without the proper drivers and acceleration. a) pull out accumulator after machine is switched off (20 seconds pressing slightly the power-button off). b) pull off the power-supply cable both ends. h) re-install ubuntu or repair the disk with ubuntu-recovery-modes, but I would prefer complete new installation alongside previous ubuntu-installation and delete Windows. i) you need to delete Windows, because the chip of the accumulator wants to make a revival of ransomware for windows as previous first-boot-installation. ... I had black screen today in the morning too, but my password was too long ... so the ransomware had no luck, despite of fact that I dont have dual-boot installation with windows here. There was only an buffer-overrun visible at my machine. I rebooted and the buffer-overrun (or underrun? - hybrid device here ...) was gone. In case Jorge Castro has a dual-boot installation with Windows (no-matter-which-one) then I simply would press quick changing with two fingers the keys 'esc' and 'F2' to get back into uefi-bios before the machine boots into black screen after you have pressed the switch-off-button slightly for 20 seconds. b) wait a while ... in case of notebook pull the plugin-cable of power- supply and stick it in again, then take out the accumulator and put it in again. e) uefi-bios should appear again ... then this is not finish ! f like foolproof) decide the boot-mode whether to enable or disable secure-boot (http://www.eightforums.com/tutorials/17058-secure-boot-enable-disable-uefi.html). This decides whether you get back into windows to launch really http://malwarebytes.org - program. g like gentleman) this is not gentleman-style but I saved your day. How to reinstall Ubuntu From Terminal? How can I disable graphical boot, yet start x during boot? After my computer boots it shows a black screen, how can i fix this?